We are able to apply a variety of different processes to create different surface finishes on the same type of stone. These different techniques are very useful when we want to use the same stone to create the "inside-outside" seamless look that is so desirable now. So, what are the options and how do we achieve them? A high gloss polish is achieved by grinding the surface of the stone with a series of increasingly fine diamond grit pads or compounds. A final process using Oxalic acid or a crystallising compound is sometimes used to increase the mirror-like effect. Marbles, granites and some of the harder, finer-grained limestones can be polished. This gives a smooth and reflective finish and brings out all the subtleties and beauty of the stone. 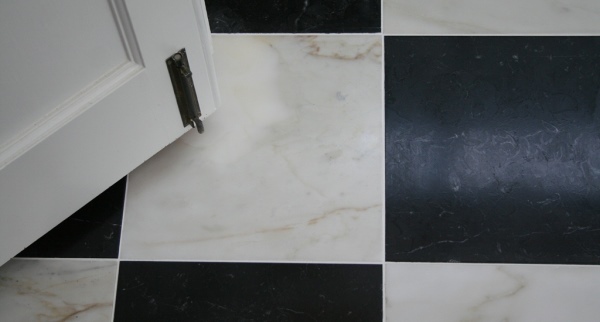 The photo below shows the reflective nature of this polished Italian Statuario Venato marble. A honed finish is created in a similar way to the polished finish above but the process stops with a coarser grade of grit. This means that the finish is less glossy and reflective but still smooth and may have a small degree of sheen. Many of the quarries that we deal with will alter the degree of honing to suit our customer's requirements. For example, if the tiles are to be used in an area where slip-resistance is important, we can ask for the stone to honed to a lower grit so that it is more matt. The Nero Marquina black marble in the image below is particularly good when honed. The detail of all the shells and fossils is brought out without the tile becoming too shiny. Brushing is done, as the name suggests, by brushing the stone with steel or hard nylon brushes. It leaves a lightly textured surface that tends to be more resilient to scratches and marks. It works particularly well on limestone and some sandstones and can also be applied effectively to tumbled marble. The example below shows a brushed Spanish Limestone Cenia Cream, and demonstrates how the brushing adds texture by gently removing the softer parts of the stone leaving a rippled surface. Tumbling is a common technique that involves distressing the edges and surface of the stone by vibrating the stone in a bath of sand and grit. There are two types of machine that can tumble the stone; one resembles a large skip which vibrates side to side and the other looks like a cement mixer and rotates the stone. The tiles go into the tumbling machine for 10 to 20 minutes to take the sharp corners off. To further distress the surface, it can sometimes be hand finished to chip the edges. The result is a finish that looks aged and worn. It is often used on the softer limestones and usually on small format tiles. With the harder stone, tumbling will have less effect and it may be that other techniques need to be used to get the "antique" effect. Brushing and edge chipping is one of the other options. Some of the French quarries produce a particularly attractive tumbled limestone as shown in the photo below. 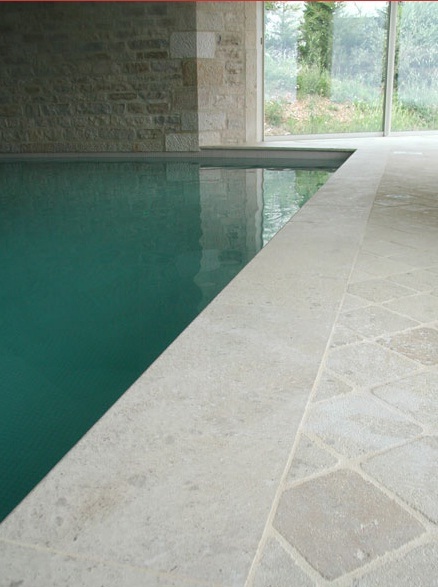 This one is the French limestone Rocheville from Burgundy with bespoke pool copings. A flamed finish is created by passing an oxy-acetylene torch over the surface of the stone and then following it immediately with a cold pressurised jet of water to fracture the top surface of the stone. On some types of stone, such as limestone and sandstone (as in the photo below of the Italian Pietra Serena), it gives a non-slip surface which is ideal for terraces or public paved areas. This is a specialised technique and not all quarries have this equipment in their workshops. Bush-hammering is done by hammering the stone with a series of steel points to break up the surface and create a pitted look. Similar to the flamed finish above, bush-hammering is a technique for creating highly slip-resistant surfaces. Like all the processes, it can be done to a greater or lesser degree. It can also be used to recreate the look of a medieval finish, as though the stone had been chiseled by hand centuries ago. A final gentle brushing with steel brushes then gives it the "time-worn" look. The image below is a French limestone, Vallangis, that has been bush-hammered and brushed. Sandblasting is a technique that also gives a more slip-resistant surface suitable for outside areas or for wet areas. We have used this on shower trays and wet-rooms and also on patios, as in the image below - sandblasted Italian Carrara marble set on Buzon pedestals. It is created by spraying the surface with sand, ceramic beads or other abrasive components at a high pressure onto the surface of the stone. This process tends to lighten the look of the stone and can mask the character by hiding the veins and shell fossils. Sometimes known as a cushioned edge, this is where the edges of the tiles are rounded to create the look of a well worn flagstone. 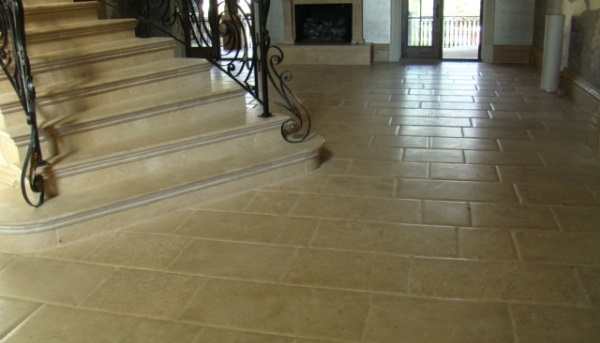 The image below shows the same French Vallangis limestone as above but in fixed widths of 400mm and random lengths on the floor and Vallangis again for the staircase. This isn't an exhaustive list by any means. 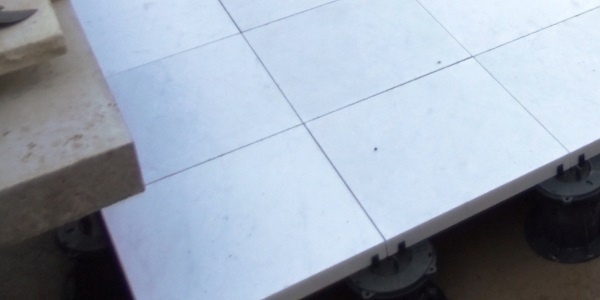 The surface finishes available for a particular marble or limestone depend upon the equipment that the quarry has at its disposal although we can sometimes apply a finish at our own workshop. If you have a project in mind and would like to discuss the different options or perhaps get some design ideas, please get in touch either by email or phone (my contact details are below). Our brochure explains more about how we work and how we can help your natural stone project be successful. P.S. - get the next blog direct to your inbox by entering your email address in the box on this page. Amarestone specialises in providing architects, interior designers and private clients with expert technical advice to help you achieve the best and most appropriate solution for your project. You can benefit from our expert knowledge and experience of sourcing the highest quality marble and limestone and other forms of natural stone from around the world.